1 April 2010, at 9:51a.m. NETHERLANDS - At VIV Europe 2010, Vostermans Ventilation will take the opportunity to present a wide variety of new products. With 'specialist in air' as its core business, the company develops to fulfill the demands of the agricultural ventilation market. To support the minimum ventilation in the poultry houses, Vostermans Ventilation introduces the Multifan Casing Fan 92, which is characterized by a compact design and which is delivered as a complete unit, easy to install. The direct driven, on/off fan is more efficient and needs less maintenance compared to belt driven fans. The fan is supplied with a new type of shutter which reduces air and light entrance from outside. 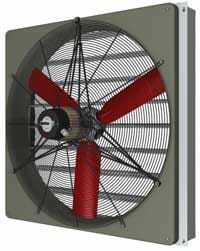 The Multifan Casing Fan 92 consists of a solid construction and is warranted for three years. The Master-5 is a main controller, to which simple 0-10V modules, e.g. 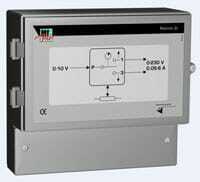 triac or frequency controller, can be connected. The Master-5 enables through a 0-10V signal, continuous variable climate control, based on temperature. It offers the possibility to control a heater and an alarm. Minimum and maximum ventilation level is adjustable. The Master-5 is equipped with an auto cooling down correction, two programmable 0-10V output signals. One of the options is to connect several modules, to control and drive fans, transformers, winch motors and valves. Vostermans Ventilation puts an inlet shutter on the market for agricultural and industrial applications. This motorised inlet shutter causes air to enter the room in a controlled manner. The shutter opens in the desired position via a 0-10 Volt signal. In the fully open position, a relatively large amount of air, in comparison to traditional air intake systems, will flow into the room. However, in closed position the shutter lets almost no air and light through. Because the motor is mounted on the inside of the shutter, installation is easy. The double bearing suspension of the louvers ensures a long life. For integration in control panels a number of various modules are available: Frelink-4f (single phase frequency control), Trilink-2t (triac controller), Relink-2s and 2c (electronic step controller) and STW & STD (step transformers). The main advantage for control panel producers is that the modules are composed according to the 'Plug and Play' principle; easy and fast integration without any rest materials. Not only the purchase of unnecessary parts is avoided, time-saving is also effected through the universal module composition. 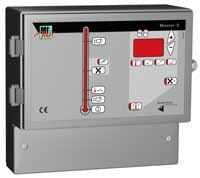 The controls are applicable for both new and existing systems.